PlugIn featuring Mastering, Metering and Loudness display for single- up to multichannel applications. Wide range of PPM scales and displays, VU appearance, and TruePPM measurements. 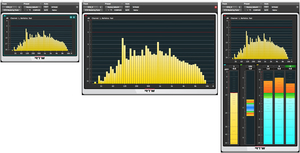 Loudness standards: ITU BS.1770-3/1771-1, ATSC A/85, EBU R128, ARIB, OP-59, AGCOM, CALM Act. Level and loudness display with bargraph type or numerical readout plus MagicLRA display. 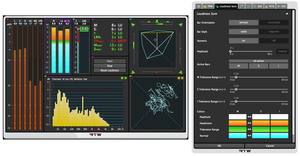 Audio Vectorscope, Real Time Analyzer (RTA), Stereo Correlator display, Surround Sound Analyzer (SSA), and Multi-Correlator. Six selectable window frames and multiple instances. Supported formats: VST2.4, VST3, RTAS, AAX, or stand-alone for Windows® 7 to 10, (32/64 bit each); VST3, RTAS, AAX, AU, or stand-alone for Mac® OS X 10.7 to 10.11. 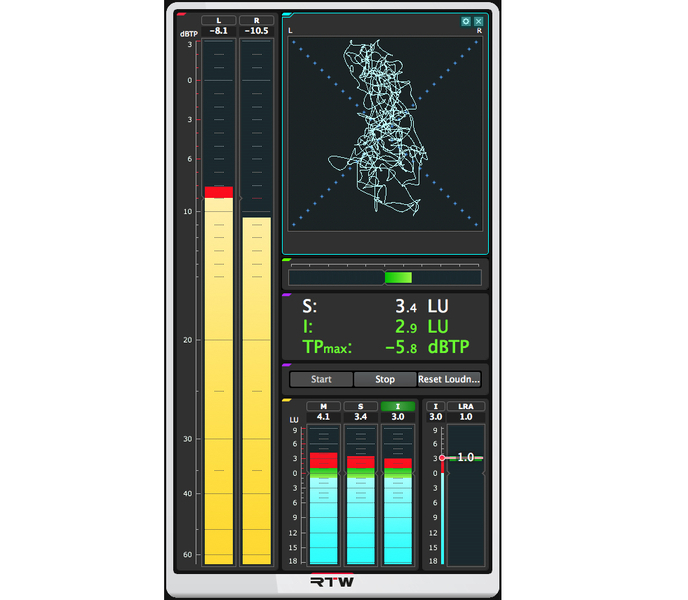 The RTW Mastering Tools are part of the RTW Masterclass PlugIns, a range of products that provides RTW meters as plug-in software and stand-alone application for Windows® and Mac OS X®. By transferring the analyzer tools to a pure software that requires no additional hardware, RTW will also make them available to musicians, radio producers, and audio/video engineers who need to meet the resulting implementation specifications required by TV and radio broadcasters. As a means for quality control, the RTW Mastering Tools with their precisely working and easy-to-read instruments ensure compliance with custom specifications. Thanks to intuitive operation, they are equally suitable for users with or without background knowledge. 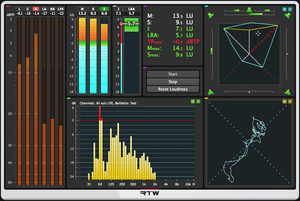 RTW Mastering Tools feature extensive analysis and display functions for mastering, metering and loudness measurements for single- up to multichannel applications including a wide range of PPM scales and displays, VU appearance and TruePPM measurements. 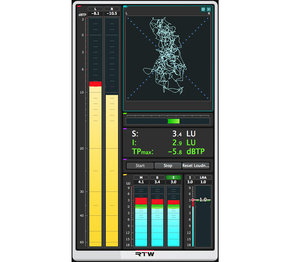 With this the RTW Mastering Tools execute the functionality of comprehensive equipped TM7 and TM9 instruments including basic and Premium PPM, Loudness, RTA, SSA, Audio Vectorscope, and (Multi-) Correlator, and offers the same degree of functionality and clarity as the hardware models. The instruments can be freely arranged and scaled. Various function parameters offer extra flexibility. Six selectable window frames (landscape and portrait view) resp. the freely adjustable display window permit the tailorable positioning of the provided instruments. Multiple instances may be used. You can store all setups and layouts as presets. You are allowed to try the software 14 days free of charge. PACE Anti-Piracy‘s iLok License Manager and a PACE iLok Account have to be used (iLok.com) for test time management. For the use without limitations after the test period has expired, an activation code is required, which you will get with the purchase of a software licence. We recommend the use of an iLok USB Smart Key for copy-protection and licence management. On an authorized computer, you can use multiple instances. 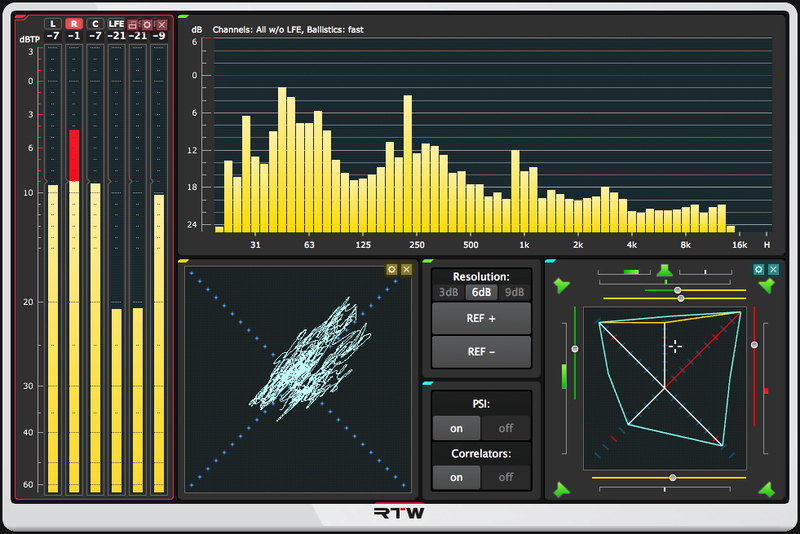 The RTW Mastering Tools are available for download at members area. Activation codes are available from our sales partners or when purchasing from our shop. Further details can be found on the "Downloads" tab in the Release Notes. You are allowed to try the software 14 days free of charge. PACE Anti-Piracy‘s iLok License Manager and a PACE iLok Account have to be used (iLok.com) for test time management. For the use without limitations after the test period has expired, an activation code is required, which you will get with the purchase of a software licence. We recommend the use of an iLok USB Smart Key for copy-protection and licence management. On an authorized computer, you can use multiple instances. PPM and TruePeak meter for up to 8 channels with comprehensive set of scales (TP60, Dig60, ARD, Nordic, BR, Zoom), bargrpah and numerical display, additional Loudness bargraphs switchable, additional control keys for positioning on the display. Loudness Sum bargraph instrument for displaying the summed Loudness values M, S, or I of a Loudness measurement acc. to EBU R128, ITU BS.1770-3/1771-1, ARIB, ATSC A/85, OP-59, AGCOM, CALM Act, or specified by customer. SPL display. Additional control keys for positioning on the display. Loudness Num instrument for the numerical display of the summed Loudness values M, S, or I, the Loudness Range LRA, the maximum values TPmax, Mmax, Smax, and the Integrated test time Itime of a Loudness measurement acc. to EBU R128, ITU BS.1770-3/1771-1, ARIB, ATSC A/85, OP-59, AGCOM, CALM Act, or specified by customer. Additional control keys for positioning on the display. Loudness Range instrument with MagicLRA mode for a graphical representation of Loudness variances. Adjustable ranges with different colors. Additional control keys for positioning on the display. Stereo Correlator instrument for displaying the phase relationship between the two channels of a stereo signal (mono compatibility). Additional control keys for positioning on the display. Multifold correlator instrument for displaying the phase relationship between the two channels of all available channel pairs of a surround signal. Additional control keys for positioning on the display. 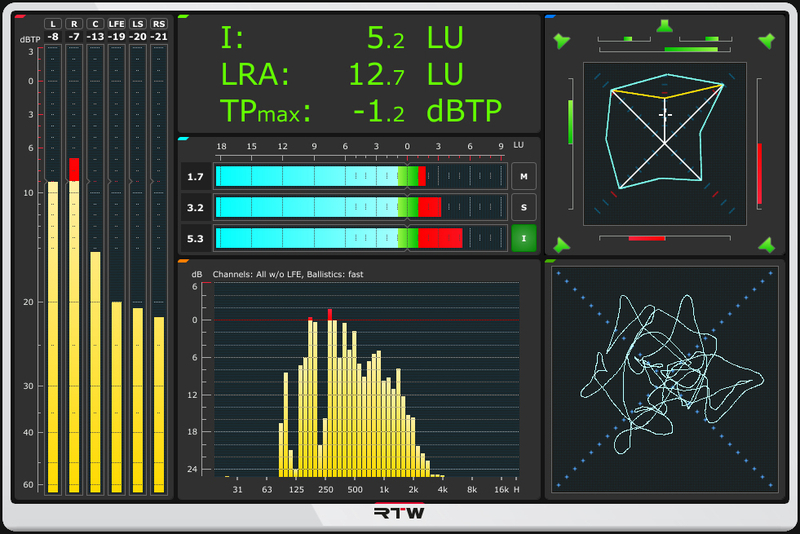 the Surround Sound Analyzer visualizes the dynamic behaviour of all display elements enabling you to see the balance of a surround programme intuitively and at a glance. Additional control keys for positioning on the display. Real Time Spectrum Analyzer instrument for displaying the spectral content of the input channels using 31 or 61 filter bands. Adjustable weighting filters. Highpass filter for High Band (> 20 kHz). 2- or 4-channel Audio Vectorscope for displaying the phase relationship between the two channels of a channel pair (Lissajous display). The keyboards include selectable on-screen keys with defined control functions for each instrument. Further details can be found in the on-screen help texts (tool tips) of the software. 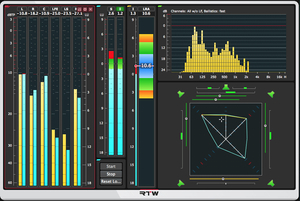 The instruments of the RTW Mastering Tools can be scaled, randomly positioned and combined. This example shows a vertical orientation of a window with Stereo True Peak meter, Audio Vectorscope, Stereo Correlator, numerical display, Loudness measurement control keys, Loudness Sum instrument with bargraphs for M, S, and I, and the Loudness Range instrument running in "MagicLRA + I + Num" mode. This example shows a TruePeak meter with peak level bargraphs on the left. In the middle you can see the numrical Loudness display, the Loudness Sum instrument in horizontal orientation, and the RTA. Surround Sound Analyzer and Audio Vectorscope is placed on the right. Beside the instruments of the previous example (some in another mode), this example additionally shows the Loudness Range instrument in "MagicLRA + I + Num" mode (above in the middle) and the Loudness measurement control keys (below the numerical Loudness display and between LRA and Surround Sound Analyzer). This example mainly shows instruments being typically used for mastering. Beside the TruePeak meter with peak level bargraphs (on the left), the focus of this arrangement is on the RTA with additionally control keys (keyboard in the middle), the Audio Vectorscope, and the Surround Sound Analyzer with additionally control keys (keyboard below in the middle). 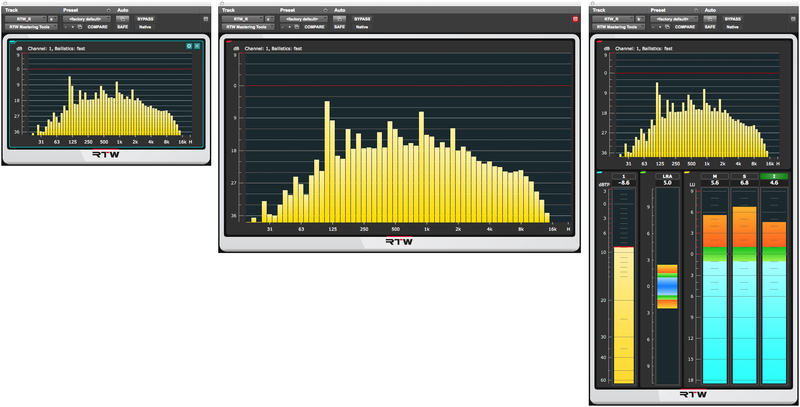 This example shows the menu page with the selectable parameters for the Loudness Sum instrument, being activated with a double-click directly from the Loudness Sum instrument. 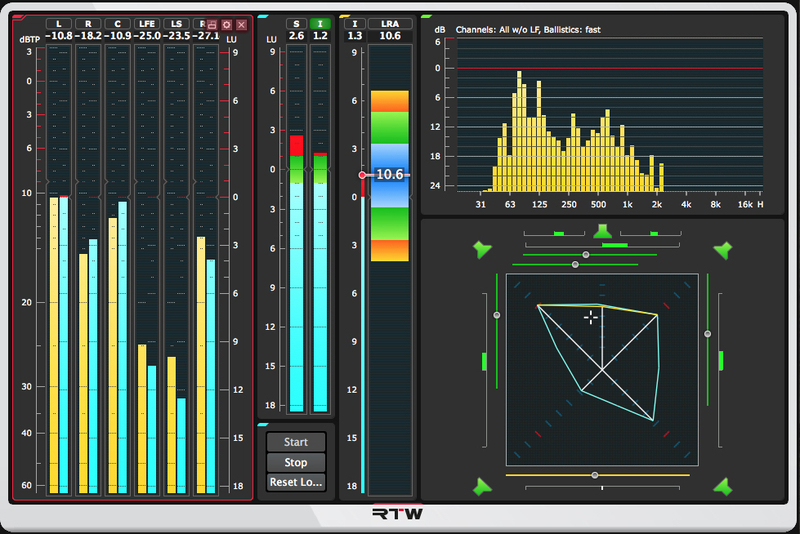 Using the comprehensive equipped setup menu and the possibility to store presets (in the plug-in or in the DAW), the RTW Mastering Tools can comfortably be adapted to individual needs. Six window frames are available (three landscape and portrait views each) for tailorable positioning of the provided instruments. The example shows the small horizontal window on the left, the middle horizontal one in the middle, and the big vertical one on the right.